are offering you the chance to win an AUTOGRPHED, ACOUSTIC guitar from country legend George Strait. Check out the new release "Twang" from George Strait, featuring the hit single "Living for the Night". 2009 album from the Country icon, the follow-up to his platinum selling Troubadour album. Strait was recently recognized by the Academy Of Country Music as the Artist Of The Decade and was honored in a primetime CBS special that won the night's ratings, proving yet again that George is King! 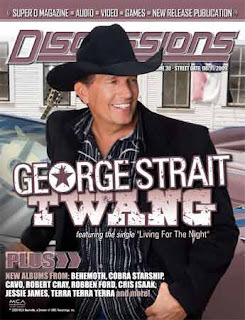 Twang features 13 tracks including the first single 'Living For The Night', which was written by George, his son Bubba and hit songwriter Dean Dillon.